You've probably heard the term "fuzzy math"? It usually or often is applied to how the government accounts for spending. And that is VERY fuzzy! But have you ever done some crazy accounting to answer the question "how many beers have you had?" Answering with words such as "around" or "something like" or "a couple" or "1 or 2" (a police officer favorite). Or playing forgetful. Or just straight-up lying. I was thinking that you could actually make those shaky answers "more" truthful (like a circle being more round) or even the absolute truth. It just takes a little creativity, and I know how creative you all are. Follow me on this. The next time you feel those questions might come up, for example on a Tuesday night alone, be sure you are drinking wine-sized bottles of beer (or at least 22's). Then "two beers, dear" or on the witness stand, "just two beers, Your Honor" will feel almost right. What do you think? No more fuzzy math. Tonight I'm drinking Java Stout brewed by Bell's Brewery in Comstock, Michigan. We have some Bell's beers down here in Florida, but this is the first I've seen this one. The label has a happy dancing mug of coffee. 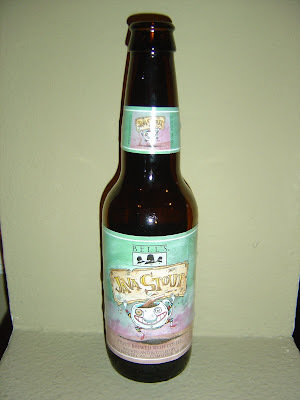 The back of the label refers to this as an "enchanting beer". Code 9451 says my beer was packaged on 11/19/2009. Aroma: roasted coffee. The end! It's Starbucks, just more inviting and appealing. The opening flavors have plenty of coffee too, and that coffee is in love with a very noticeable chocolate flavor. Roasty mocha goodness. Great medium to upper body and medium carbonation. Smooth and silky texture. Bitter, but not overly so. This isn't a very complex beer as it can be summed up with "bitter roasted coffee beer" but the flavors are very nice. The 7.5% alcohol is unnoticeable. I liked this beer, but liking coffee is a prerequisite for drinking this beer! (Unlike coffee ice cream, which even non-coffee drinkers can appreciate.) Check it out! Kona Pipeline Porter is a good starter coffee beer. Left Hand/ Terrapin Depth Charge was probably my favorite. Yep, Kona is a nice introduction. I've never had your favorite before, but you know where I'll be looking for it!